The BC Government held a public consultation on the upcoming provincial budget. HUB Cycling submitted a letter of recommendations to the committee. On Nov 15, 2018, the Committee released its unanimous report on the Budget 2019 consultation including the following recommendations on Active Transportation (Walking and Cycling). HUB Cycling and the British Columbia Cycling Coalition recommended increased investment in cycling infrastructure, including the creation of complete cycling networks in communities across the province. Both organizations explained that a lack of a connected network of safe cycling infrastructure presents a barrier to cycling and that cycling has been shown to increase significantly when investments are made. This barrier was also identified by cycling advocate Fiona Walsh who suggested creating cycling highways to reduce interactions with cars and speed up commutes for people who bike to work. She noted that expanding cycling infrastructure would have the added benefit of encouraging British Columbians to transition away from vehicles. The Greater Victoria Cycling Coalition described challenges with current grant funding processes and requested increased funding, as well as targeted mechanisms to ensure smaller municipalities have access to funds. HUB Cycling shared that cycling provides a return on investment by delivering savings in health care, pollution and congestion-related costs, insurance, and police and ambulance related services. The British Columbia Cycling Coalition also noted these benefits, and further emphasized that an expanded cycling network could provide tourism opportunities. The British Columbian Cycling Coalition further identified opportunities to extend cycling as a transportation option for more people with the use of electric, cargo, and adaptive bicycles. Electric bicycles can increase the number and length of cycling trips, and enable people with physical challenges to cycle for transportation. Transportation and Transit Cargo bicycles, on the other hand, help people to carry children or larger loads on their bicycles and can be used by businesses for deliveries. They recommended exempting these bicycles from the PST to encourage their adoption and use. The Committee also received requests for funding cycling education at all ages. The British Columbia Cycling Coalition recommended skills training, funding for bike-to-work weeks, and the integration of driver and cycling training. They explained that access to training will make cyclists more confident and enable them to interact safely with people in cars. HUB Cycling suggested targeting cycling education to elementary-aged children as part of a broader active transportation strategy to increase the number of British Columbians who grow up with strong cycling skills. The BC Alliance for Healthy Living Society also supported funding for an active transportation strategy. They drew a connection between built environments and healthy communities and explained how community planning and design can influence whether individuals are regularly active. The organization pointed to successes in Vancouver and Victoria where investments in active transportation infrastructure have led to a move toward active modes of travel. 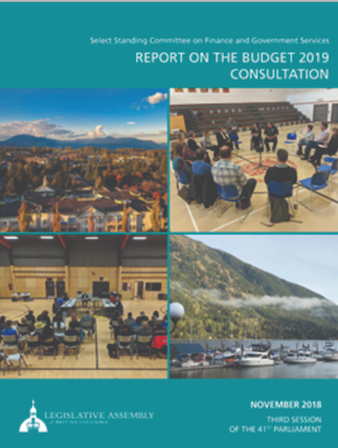 The Select Committee's complete report on the Budget 2019 consultation is available here. HUB Cycling's letter of recommendations is available here.